Shares of Apple Inc. (NASDAQ:AAPL) exhibited uncharacteristic weakness in Thursday’s trading session. Amid an otherwise go-nowhere day for U.S. markets AAPL stock tumbled 1.66%. While the dollar amount of the drop is arguably insignificant the sudden onset of relative weakness is worth mentioning. It’s just so un-Apple like. But, hey, even the world’s strongest stock is allowed an off day or two. With the technical structure of Apple’s stock chart remaining incredibly bullish the current dip is undoubtedly a buying opportunity. Any time a strong trending stock begins pulling back it pays to watch for potential support levels that may halt the decline as well as provide lower risk entry points. Though Apple stock closed slightly below its rising 20-day moving average it’s nestled closely to an uptrendline in the $125.50 area. We’ll find out pretty quickly if buyers materialize to defend this price level for AAPL, which was just announced as a new member of the Dow Jones Industrial Average, replacing AT&T Inc. (NYSE:T). If a deeper retracement materializes AAPL should find substantial support in the $120 zone. This area acted as major resistance and is thus likely to turn into major support when retested. A dip to $120 will be viewed as a gift from the market gods for would-be Apple stock buyers. Traders looking to capitalize on the AAPL drop with a high probability of success should consider April bull put spreads. By using far out-of-the-money options you can establish a wide profit range just in case the AAPL slide gets a bit too slippery. Sell the Apr $120/$115 put spread for $1.05 or better. 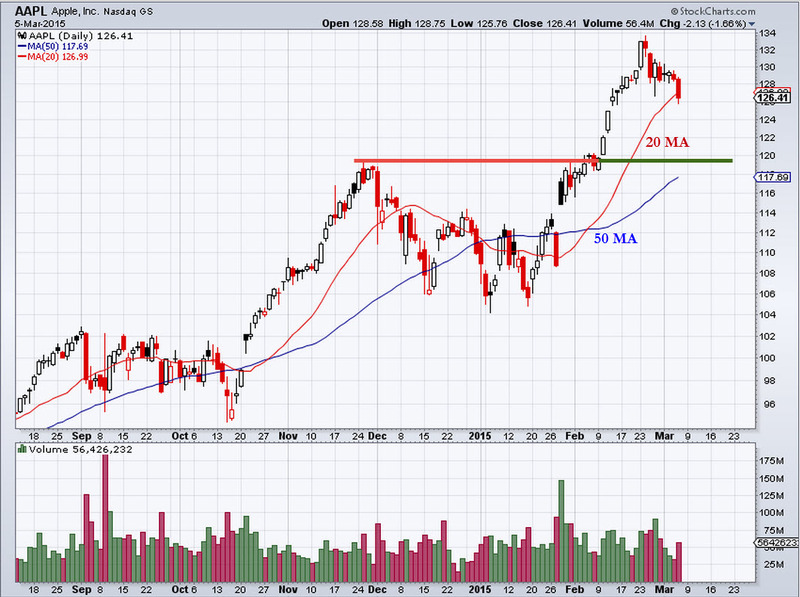 Consider it a bet AAPL fails to fall below $120 by April expiration. The maximum reward is limited to the initial $1.05 credit. The maximum risk is limited to the distance between strikes minus the net credit, or $3.95, and will be lost if AAPL descends below $115. With a delta of 27 the Apr $120 put is pricing at a 73% probability that AAPL remains above the $120 threshold by expiration. In other words, the odds of you capturing the $105 gain — a respectable 26% return — is 73%. At the time of this writing, Tyler Craig owned bull put spreads on AAPL. Article printed from InvestorPlace Media, https://investorplace.com/2015/03/aapl-heres-play-apple-stock-dip/.